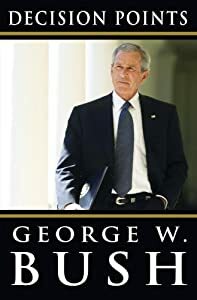 My daughter gave me George W. Bush’s book, Decision Points. One of the big things I like about President Bush is that he is one of the few conservatives who seems to have a sense of humor. We could forgive someone who is the president of the United States for a smidgeon of hubris, but amazingly, George W. Bush appears to be a president who takes the world and major decisions seriously without taking himself too seriously. The book is about making decisions on a world scale. The title is spot-on for how George W. Bush viewed his job. He made decisions at crucial times after 9-11 that changed the world in many ways, some for the better, and perhaps some that have put a big red X on the backs of Americans precisely at the time when the world’s sympathy was with us. Decisions he made turned that tide and made us great enemies but who knows that those same decisions didn’t save the United States and the world from an even worse fate? I like this new word made up by the team of the new web browser Rockmelt that integrates Facebook and other social media. That’s how I feel quite a bit after preaching a sermon or publishing a book (they are all imperfect, but I’m proud at the same time–proudbarrassed). I’m reviewing a new book by Sergio De La Mora, pastor of the third fastest growing church in North America, according to Outreach Magazine. I’m in Owasso this am for a meeting and over the hill to the East the sun is rising. I’m reminded of one of our readings last night in the congregational meeting at Garnett. We gathered to take another step into The Story and read passages to one another from Judges. In particular some of the ladies read from Deborah‘s Song (Judges 5). Seeing the sun at dawn, I’m reminded of the last line we paused to concluded with last night. I want to encourage us today with this verse. One problem is that you must know the context of this verse, and it may spoil the above verse for you, but more importantly perhaps it will draw you and me more into the amazing story of God and his people. Jon Hart knocked it out of the park Sunday when he preached in my place on the Judges. You are indeed a Jedi, Jon. So back to the line before this colorful scripture I quoted above about the sun. The preceding line says, “O Lord, may all our enemies die like Sisera.” Deborah and Barak are singing about “Jael and the nail,” an old Neal Pryor-ism. Look it up (Judges 5:24-31). Eric Schlosser is one of my favorite authors, an investigative journalist who wrote Fast Food Nation. When I read his groundbreaking book, I became more fascinated with the food industry in the world. He and Michael Pollan have co-produced this new documentary that draws from the excellent work of Pollan and Schlosser. I’ve highly recommended the books and do the same for this award-winning documentary.